A majestic 8-storey podium will anchor the point tower, while animating the streetscape with a presence that’s both imposing and welcoming. With its size, scale and mass, The Britt will virtually own this intersection of the city, defining a prestigious new address for the status- conscious city dweller. Whether at street level or up in the skies, The Britt is where London chic meets Toronto energy. 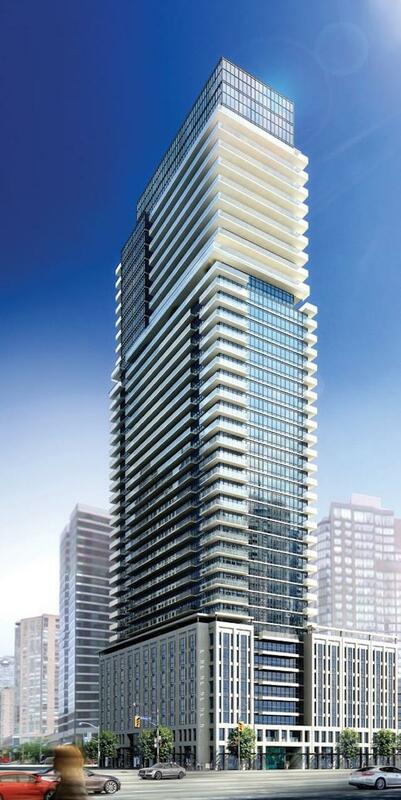 Architecturally, The Britt will rise with soaring elegance above the intersection of Bay and Wellesley, offering spectacular panoramic views of the city skyline. An articulated façade clad in iridescent blue glass and sleek lines of stone and steel makes a classic statement of distinction. The upper storeys of The Britt will present a dramatic façade with shimmering glass and wide horizontal balconies that wrap around the building. The ground floor will be an amenity-rich area with a warm and welcoming lounge, exquisite appointments and 24-hour concierge. The Britt lobby features marble-faced portals which lead to the reception area and lobby lounge off the main level. The Harlequin- patterned floor, glass chandelier and collection of bold art prints add modern sophistication to the lobby’s grandiose atmosphere. The focal point of the Britt’s expansive, double-height lobby is its grand staircase. Splitting elegantly into two, the staircase steers up to an atrium level: the left staircase leads to a private lounge and boardroom, while the right staircase connects to an additional lounge space. Ornate balconies on either side overlook the spacious lobby below. The atrium level connects with the Britt’s second-floor amenities and outdoor terrace. The design has the amenities programmed in the same fashion as a fine hotel – featuring a spa with hot tub and sauna, outdoor landscaped terrace, state- of-the-art fitness facilities and function rooms allow guests to socialize, conduct business, or relax in privacy. The lobby lounge features a plaster relief-patterned ceiling, ambient fireplace with carved stone facing, stylish seating and elegant light fixtures, surrounded by designer-selected accessories. Crisp walls featuring applied moulding wrap the room, with the focal point being a collection of photographs preserved from the original Sutton Place Hotel. These photographs feature starlets and celebrities who had previously stayed at the hotel, and act as a nostalgic connection to the building’s acclaimed history. Luxury meets harmony on the second floor, where the magnificent landscaped terrace is your party central. The contemporary urban décor is highlighted by warm wood, sleek stone and iridescent glass. Stylish outdoor fireplaces inset within textured slabs, plush modern seating alcoves and a fresh, open ambience add a touch of urban chic to the surroundings. Barbecue services and cabanas bring taste and panache to your summer parties. If you want to take your celebration up a notch, the spectacular ninth floor terrace courtyard is the venue for you. Exquisitely landscaped with a sculptural centerpiece surrounded by gorgeous greenery, the highlight of the Terrace is the stunning infinity pool area. Alfresco living meets urban chic. Designed on the lines of a cool, modern open-air lounge, the terrace has plush comfortable seating alcoves separated by stylish wooden partitions. Invite friends over for an exhilarating summer party under clear blue skies. Break out the bubbly and celebrate a special occasion.